Our tour guide will meet you on your flight time. We will have a group dinner after check in the hotel. Locted in Urumqi Xibei Road, the Xinjiang Regional Museum is a large integrated museum and centre for the collection and study of cultural relics in Xinjiang. The museum architecture built in 1953 with featured Uighur ethnic internal decor style and has an exhibition hall covering an area of about 7,800 square meters (approx. 9,328 square yards). After breakfast go to see Kanas Lake, cruises on the lake and visit Tuwa Tribe village. The Kanas Lake is a magical and appealing place for all ages. Maybe the Kanas is an enchanting Mongolian name which means "a beautiful, abundant and mysterious lake in a gorge". The travelers called it as "Switzerland in East" or "Camerists' Heaven". Tuwa Tribe is a Mongolian tribe lives on the south bank of the Kanas Lake. Believing in Lamaism, it is a valiant ethic minority with a long history. Tuwa people speak Turkish, resembling the language of Kazakh, and live on hunting and graze. They also have a special folk custom. Hemu Village is one of the three residences of the Tuva Mongol in China. The Tuva Mongol is considered to be the later generations of the troops of Genghis Khan when he crusaded west. The Tuva Mongol of Hemu Village lives in frame houses half-buried in the ground to resist the chillness of winter. They believe in Buddhism and have well preserved the traditional beliefs of their tribe. Religious and traditional festivals are always jolly and busy, while the landscape tempts every visitor come back to experience the wildness of nature. Karamay ("black oil" in the Uygur language) became famous in the 1950s for petroleum production. Oil and natural gas are Karamay's main mineral resources. Ghost City is the most beautiful Yardan landform in this region.The movie "Crouching Tiger, Hidden Dragon" has left you a deep impression of the multi-colored bay where the heroine Ziyi was hidden, this special desert scene shot in the movie is located at the Gobi desert. Take a drive to Sarym Lake and overnight in local Mongolian Yurt. Drive to Yili and visit Hurgos border, enjoy the beautiful scenery of Fruit valley. There are numerous pine trees in Fruit Gully. Known as the "1st scene of Ili", the gully has a pleasant cool weather in summer and autumn, and the ground is covered with flowers with bees and butterflies flying and dancing among them. Countless fruits hanging from the branches of the trees on the hillsides, pure white snow far and near. 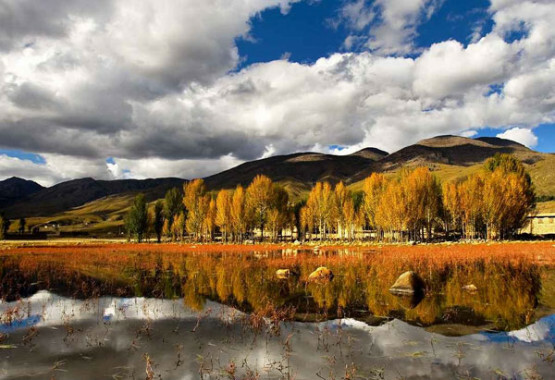 After breakfast drive along the National Highway runs across the Tianshan Mountains to visit the Naraty Grassland. Nalat Grassland boasts sub-alpine belt, and it has been a famous pasture land ever since the ancient times，and there are wide river valley, high mountains，the crisscrossed deep gores，the flourishing forest and open grassland．It is crowned as "air pasture"and "garden highway". After breakfast drive to Bayinbuluk and enjoy the beautiful landscape there. The Tian Shan, also Tien Shan, is one of the world's largest system of mountain ranges located in Central Asia. On 2013 Conference of World Heritage, the eastern portion of Tian Shan in western China's Xinjiang is listed as a World Heritage Site. Kuqa Mosque is situated in the north of the old city of Kucha and covers an area of 1165 square meters. The mosque is composed of a main worshiping hall, a small worshiping hall, a minaret, a qubbah, a religious court and hostels, etc. It is a representative of Uygur architectural art of the Qing Dynasty. Subashi ruins lies on the ridges on both sides of Kucha River and 23 kilometers to the north of Kucha City . "Subashi" means "headwater of a river". It is composed of two parts divided by the river. It is the biggest one of Buddhist temples in Xinjiang. Kizil Grottoes are the caves excavated on the cliff of Qul-tagh Mountain by the Muzart River. As the earlist caves in Xinjiang and China, the paintings are very rich in contents. Including jataka stories, Budda's life story and the stories about karma. Great Tianshan Canyon is known as the most stunning Canyon in China. It's five thousand meters in total length, and two hundred meters in average depth. The Grand Canyon was once the ancient river course for Kucha River. Id Kah Mosque: "Id Kah" means a place of praying and celebrating in festivals. The Id Kah Mosque is located on the central square in Kashgar City, Xinjiang Uigur Autonomous Region. As the biggest mosque in China, it is a group of old Islamic constructions with strong ethnic style and religious features. Handicraft street is choked on Sundays with farmers and buyers arriving by donkey cart, truck, bicycle, horseback, Ute, motorbike or on foot, with their animals. Karakorum high way is 1200 kilometers and was build since 1976. It is the representative of Sino-Pakistan friendship. The Karakul Lake is a paradise of bonfire night parties for boy and girl khalkhas with tourists. The party is full of songs and dances, as well as good smell of roast lamb skewers. Stone City was built on a mound of 20 meters high (about 67 feet high), all that remains of the Stone City today are some parts of the periphery of city, such as the gate, city wall whereas the buildings inside the city had all collapsed. However you can still enjoy the view of the ruined city. Honjirap border means "red wall"in Tajik language,while "blood ditch"in Uygur language.From ancient time up to now,it has always been the natural barrier. In this place, oxygen is only 48% of the plain and there are just 60 frost free days. Old town Kashgar is located opposite to the Id Kah Mosque. It has a history of over 2,000 years and is the best place to see the life style of local Uyghur ethnic group. Places to visit: Sunday Bazaar, Apak Hoja Tomb, Yarkent Old Town, Yarkent King and Amanishan Tom. Sunday Bazaar is located in the city east, Kashgar Grand Bazaar, Sunday Bazaar, Mal Bazaar or the livestock market on Sundays, daily Yengi Bazaar etc. show the glory of the largest international trade market or fair on ancient China Silk Road. Apak Hoja Tomb is the holiest place in Xinjiang and an architectural treasure. Built in 1640, it is reminiscent of the Central Asian artistic style of Samarkand or Isfahan. Yarkent Old Town is the best preserved old town in Xinjiang. It is the main shopping center for the locals so that you can enjoy the authentic handicrafts for the local Uygers and know more about their daily life. Yarkent King and Amanishan Tomb forms an oasis at the western end of the Taklimakan desert as a trade center. Mainly inhabited by Turkic-speaking Muslims, it has more than 120 mosques. The Uygurs are excellent at dancing. The Atlas Silk Workshop is open every day and tours are free. It demonstrate the entire process from cocoon to weaving, where you can buy Atlas silk by the meter or made into scarves, bags, dresses and other items. Khotan Museum was built at South Tanai Road, Khotan City in 1991. The museum has a floor space for exhibition of about 200 square meters. Besides wooden tablets, the main exhibition "Khotan Historical Relics Exhibition" displays potteries, wooden wares, textiles, sculptures and building components from ancient sites and tombs in Khotan area, totaling over 200 specimens. Taklamkan Desert Highway is the biggest moving desert in the world and most of the people believe that it has buried most of good civilizations among the central Asia. It occupies more than 345,000 square km. Diversifolious poplars Park is located in the north of Taklimakan Desert, the middle portion of Tarim River. There are sights of Tarim River, the poplar trees, the desert and the oil industry. It is a good a tourist resort of sightseeing, entertainment, adventure, scientific expedition and vacation. Iron Gate passan is an ancient strategic gateway constructed at the entrance of the Peacock River Gorge. Uyger Show, a folk dance in Turfan, is famous for its grace, nature, lightness and cheerfulness. Under grape trellises in summer, loud and clear sounds of tambourines and Suona horns, graceful dance, and affecting "Meshrep" can clear up the hotness and refresh you after you journey. Bezklik Grottoes is located 50 kilometers to the east of Turfan City . "Bezeklik" means "a place with beautiful decoration". There are 83 numbered caves; among them 40 preserved murals totaling 1200 square meters. These caves are first excavated in Qu`s Gaochang period. Astana Tombs covers an area of 10 square kilometers. Between 1959 and 1975.It had been excavated 13 times, and a great number of cultural relics have been unearthed, including Chinese documents, textiles, epitaphs, coins, clay sculptures, pottery, wooden wares, silk-paintings, crops and foods ,etc. As Turpan is a kingdom of Grapes, all the local uyger families plant the grapes at the back of their house. Local Uyger family visiting is a special experience for you to know their lifestyle in the fireland. Located 10 kilometers west of Turpan in China's Xinjiang Province, the Jiaohe Ruins is an archaeological site which was an important stop on the Ancient Silk Road. It is the largest, oldest, and best preserved earthen city on earth. The Karez underground irrigation channel in Turpan is one of China's three greatest feats of ancient engineering, along with the Great Wall and the Grand Canal. Construction began on this ancient irrigation system during the Han Dynasty and as the Silk Road developed, methods of construction found their way to Central Asia and Persia. Turpan Minority Souvenir and Carpet Shop is located at the suburb of Turpan, mainly manages the Xinjiang carpet, the Hetian jade, some Xinjiang famous raw material for medicine as well as introduces Xinjiang's traveling class books. After break fast You will be transferred to the airport and back to your destination.